Few other titles in the existence of modern comics can tout the A-list pedigree that Swamp Thing has enjoyed: Alan Moore, Mark Millar, Grant Morrison. Now industry wunderkind Scott Snyder is ready to try his hand at the rebooted creature from the swamp. How does he fare? You know the drill…take the jump for details! Previously: Alec Holland has found himself once again, among the living. Just how long he’s been ‘deceased’ is subject to speculation. 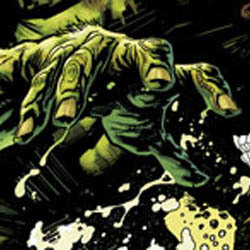 Alan Moore established that Holland had ‘died’ during the initial birthing of the Swamp Thing creature. The creature simply housed Holland’s essence, although his actual mortal coil had been shed. To be more specific, burnt to a crisp and then submerged in the murky swamp water. Swamp Thing originated in the standard DC Universe, co-existing in a somewhat awkward co-habitation agreement with all of our favorite DC characters. Once Moore’s success at mature storytelling was cemented, a new imprint was created to represent these emerging dark stories. You may have heard of it…Vertigo. Now Holland is alive and planted back in the DC Universe. Superman would like to have a word with him regarding some mysterious ‘natural disturbances’ taking place across the globe. Holland’s history is in botany. That’s where he pursued his life’s work, the experimental compound which eventually transformed his essence into Swamp Thing. While Holland is unwilling to traverse the same path that eventually led to his ‘death,’ his ties to the world of vegetation are not completely severed. He still has a close affinity with his environment and is able to sense vegetative minutia, such as near-microscopic cases of wood rot in planks of building lumber. As a matter of fact, building materials are just symptomatic of Holland’s new vocation of choice; construction laborer. Despite his unwillingness to face his past, it doesn’t take long for someone like Superman to track down his location in order to get his take on a string of unexplained, nature-derived anomalies happening all over the planet. Although characterized in brief glimpses, we see Aquaman bearing witness to a lot of dead fish, Batman dealing with dying bats in his cave, and Superman watching the Metropolis sky filled with expired birds. Superman confronts Alec with facts surrounding these instances of ‘phenomena,’ yet Holland’s science-fortified defensive mechanisms provide a strong testimonial against his brand of expertise in this situation. Superman attempts to bond with Holland, commiserating over the trauma of coming back from the dead. This would seem to confirm that the Death of Superman storyline still transpired in this new DCU. After everything’s said and done, Holland spins some creative allegories and ultimately asks to be left alone. Strange things are definitely afoot, and by the end of this first issue, it appears that destiny has a strong opinion when it comes to Holland’s involvement in helping to address these happenings. Snyder does an admirable job of helping the reader understand the nature of Swamp Thing’s core. Holland is harboring a lot of angst and most of his characterization in this issue amounts to a lot of whining. 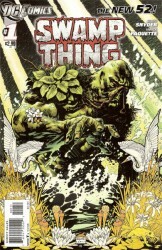 This is Swamp Thing with very little action and a lot of internalization. Having said that, internal monologues and metaphor are nothing new for Swamp Thing readers. Perhaps with time the depth thought will blossom, but so far, there are only a few pages worthy of its pedigree. Artist Yanick Pacquette’s visuals are best suited to the supernatural elements of the book. All of the dark and twisted stuff looks gorgeous, while his figure work is just standard. By involving the rest of the DCU in the world of Swamp Thing, I fear that superheroes will be making regular appearances in the book, which doesn’t appear to play to Paquette’s strengths as an artist. If there’s anyone who’s earned a shot at Swamp Thing, it’s Scott Snyder. He’s proven himself time and again as a gifted storyteller. I hope that Swamp Thing’s reintroduction into the regular DC Universe does not hobble Synder’s creative palate. This issue did a reasonable job at bringing Alec Holland back to the land of the living and it appears that his adversary is going to be epic. Swamp Thing #1 earns 3.5 out of 5 stars. Really excited to see Swamp Thing may still be separate from Holland. That was one of Moore’s best steries, and I’m not a fan of the de-Moore-izing of the DCU so far. I like where this is going though: this and Animal Man. Alright, most of your complaints are books that aren’t even out yet, so those arguments are moot. As for your other arguments about Swamp Thing, Batgirl and Batwing, I found them quite accessible. Swamp Thing tells you where he stands with past continuity, but it moves forward. If you’ve never read Swamp Thing before, you know who he is, what he does, and where he stands. As the book moves forward in new directions, new readers will be introduced to old and new characters. Right now, the fans are complaining about how in the dark they are about how everything fits together, but it’s only as murky and uncertain as any good story with an edge of mystery. I highly doubt any reader of these comics doesn’t know who Robin or Green Lantern is, and the stories are fresh enough that new readers can jump in very easily, but with enough lip service to what’s come before to keep the slobbering fanboys sedated. You know, this is not how you reboot a universe or attract new readers. Sales figures for highly promoted first issues. How many are longtime fans, how many speculators, and how many are going to stay with the books has yet to be seen. I don’t know if new readers are going to be entranced by convulted backstories like Green Lantern and Batman, ultraviolet heroes like Savage Hawkman, Wonder Woman or Blackwater Blackhawks, or 2.99 books that give you about 1/6th of a story. Time will tell. True, time will tell. I’ve had friends asking me on Facebook and elsewhere what I thought about the new relaunch and about some titles and until now, I had no clue they read comics and a couple hadn’t read comics in years and it was enough to bring them back into the fold. That may be short-lived and most may drop back off after the novelty wears off, but maybe enough people will find something they like back in comics and will stay. That seems like a win to me. I don’t think it’s been established that Barbra was Oracle. It’s a relaunch, and it’s a number 1 issue, that doesn’t mean they have to go back and retell everyone’s origin stories all over again. It seems more like they went back in time and they’re looking at all these characters if at some point in their history, time took a divergent path. Plus doesn’t everybody complain about ANOTHER origin story every time they have one. Plus the way they’re doing it right now, you already know that things are different than before (even if only a little in some cases) whereas if you start all titles from the very beginning of those characters, you’d have to wade through a bunch of issues before ever really finding out if there’s going to be any difference between old DCU and the DCnU. I actually think this is the perfect way to relaunch these characters. Just going in and seeing who they are and knowing that there’s pre-existing history with these new takes on the heroes is cool. They can do flashbacks and pull villains and situations from the characters’ past without everyone asking where they came from since you’d seen their entire rise from Clark Kent to Superman and never saw that person who’s now set up at the villain. I dunno, I think it’s pretty brilliant actually. As they say though, mileage as always will vary. Superman looks like Robert Z’Dar.